April 1, 2012 - The Airbus Military A400M new generation airlifter recently visited La Paz, Bolivia as part of a series of high-altitude performance tests. Grizzly 2 completed a number of flights from the airport at La Paz which is more than 13,000ft above mean sea level. Operations from high-altitude airports like La Paz are challenging because of the low air density. The tests took place shortly after the aircraft visited the FIDAE airshow in Chile, and Lima, Peru during its first deployment to Latin America. Airbus Head of Flight and Integration Tests. Fernando Alonso said: ?High altitude testing is a critical part of the overall flight-test program which will ensure that we deliver on our performance guarantees to customers. I am pleased to say that the early results from these trials have been very positive.? The Airbus A400M, also known as the Atlas, is a multi-national four-engine turboprop military transport aircraft. It was designed by Airbus Military as a tactical airlifter with strategic capabilities. The aircraft's maiden flight, originally planned for 2008, took place on 11 December 2009 in Seville, Spain. The A400M is undergoing flight testing. Orders totaled 174 aircraft from eight nations as of July 2011. Airbus Military is expected to deliver the first aircraft in early 2013. In July 2010, the A400M passed a key test: ultimate-load testing of the wing. On 28 October 2010, Airbus Military announced that it was about to start refuelling and air-drop tests. By late October 2010 the A400M had flown 672 hours of the 2,700 hours expected to reach certification. Cold weather testing is to be performed in either Canada or Sweden. In November 2010, the first paratroop jumps were performed from the A400M. In December 2010 the A400M fleet's flight time has risen to 965 hours. A400M number four joined the test fleet with its first flight of over five hours on 20 December 2010. Winter tests were done in Kiruna, Sweden during February 2011. By April 2011 a total of 1,400 flight hours over 450 flights had been achieved. 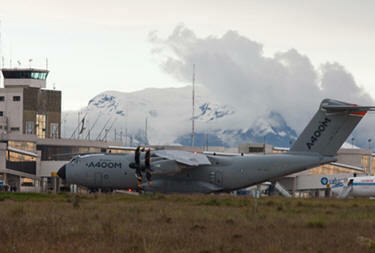 In May 2011 the A400M's EPI TP400-D6 engine received certification from the European Aviation Safety Agency (EASA). In May 2011, the A400M fleet had totaled 1,600 hours over 500 flights; by September 2011, the total increased to 2,100 hours and 684 flights. Due to a problem with the gearbox the A400M did not fly demonstrations at the 2011 Paris Air Show. It was shown on static display instead. By October 2011, the total flight hours had reached 2,380 over 784 flights. A minor problem that occurred during wet landing test led to reconstruction of landing gear parts. High-altitude start and landing tests will be performed at La Paz in Bolivia. The Airbus A400M will increase the airlift capacity and range compared with the aircraft it was originally set to replace, the older versions of the Hercules and Transall. Cargo capacity is expected to double over existing aircraft, both in payload and volume, and range is increased substantially as well. The cargo box is 17.71 m long excluding ramp, 4.00 m wide, and 3.85 m high. The height is 4.00 m aft of the wing and the ramp is 5.40 m long. The A400M will operate in many configurations including cargo transport, troop transport, Medical evacuation, aerial refuelling, and electronic surveillance. The aircraft is intended for use on short, soft landing strips and for long-range, cargo transport flights. It features a fly-by-wire flight control system with sidestick controllers and flight envelope protection. Like other Airbus aircraft, the A400M will have a full glass cockpit (all information accessed through large colour screens) and as such will represent a technological leap compared to the older C-130s and C-160s that many countries now operate. The A400M's wings are primarily carbon fibre reinforced plastic. The eight-bladed Scimitar propeller is also made from a woven composite material. The aircraft is powered by four Europrop TP400-D6 engines rated at 8,250 kW (11,000 hp) each. The TP400-D6 engine is to be the most powerful turboprop engine in the West to enter operational use. One of the few propeller powered aircraft with swept wings, the turboprops provide an efficient cruise speed of 780 km/h (480 mph) which falls between the C-130 and the jet-powered C-17.